You are here: Home › Further Reading › JFK Assassination FAQs › How Reliable is the Neutron Activation Analysis Evidence? How Reliable is the NAA Evidence in the JFK Assassination? Neutron activation analysis suggested that Lee Oswald had not fired a rifle on the day of the assassination, and at first appeared to prove that all the bullet fragments came from only two bullets, although this has since been debunked. Neutron activation analysis is currently the most sensitive and reliable method of measuring quantities of elements within compounds. 74 elements are susceptible to NAA, which can detect quantities in the range of parts per billion. A sample is subjected to bombardment by neutrons, which causes individual nuclei within the sample to become radioactive. As each radioactive nucleus decays, it gives off gamma rays, whose distinct properties allow individual isotopes to be identified. The gamma rays are measured to determine the rate of decay for each isotope. The rate of decay, measured against that from a comparative sample of an element, allows the concentration of that element within the original sample to be determined. For details, see e.g. Michael D. Glascock, ‘Overview of Neutron Activation Analysis’ at missouri.edu. Paraffin wax casts were taken of the hands and right cheek of Lee Harvey Oswald, the only official suspect in the murder. The casts were tested by NAA within weeks of the assassination to see whether they contained incriminating quantities of gunpowder residues. Similar tests were done on a controlled sample of casts from marksmen who fired a gun of the same type as that found on the sixth floor of the Texas School Book Depository. and whether the fragments from Connally’s wrist had come from the magic bullet. Did Lee Harvey Oswald Fire a Rifle? The results show Punctate traces of nitrate found in the paraffin on the right and left hands consistent with that of a person who handled or fired a firearm. The paraffin of right check [sic] showed no traces of nitrate. The absence of traces of nitrate on his cheek suggested that he had not fired a rifle that day. Senior officials at the Atomic Energy Commission got in touch with the FBI, and made several offers to perform NAA tests on the paraffin casts and the bullet fragments. Grudgingly, the FBI agreed, noting that Oswald’s murder had ensured that the tests would never be examined at trial, and that “any such examinations will, of course, be with the strict understanding that the information and dissemination of the results will be under complete FBI control” (FBI HQ JFK File, 62–109060–5). The tests were performed in December 1963 and January 1964. The FBI informed the Warren Commission of the tests in March, pointing out only that “as a result of these [neutron activation analysis] examinations, the deposits found on the paraffin casts from the hands and cheek of Oswald could not be specifically associated with the rifle cartridges” (FBI HQ Oswald File, 105–82555–94). The Commission did not follow up the matter until early September, when the Warren Report was about to be published. The Commission called its final witness, John F. Gallagher, the FBI laboratory specialist who had overseen the NAA examinations of the paraffin casts and the bullet fragments ( Warren Commission Hearings , vol.15, pp.746–52). As with the large majority of the Warren Commission’s witnesses, the only people present were the witness, a stenographer, and the questioner, who in this case was Norman Redlich, one of the Commission’s staff attorneys. Before the interview, Gallagher and Redlich discussed the areas that would be included, and those that would be ignored (ibid., p.752). Redlich limited his questioning to Oswald’s paraffin casts, and carefully avoided asking for details and precise measurements. Neither man mentioned the fact that NAA tests had also been applied to the bullet fragments. I found that there was more barium and antimony on the inside surface of the cast than you would find on the cheek of an individual who had recently washed his cheek. Neutron activation analysis supported the conclusion of the spectrographic examination: there were no incriminating quantities of gunpowder residues on Lee Harvey Oswald’s right cheek. and keeping out of the official record the NAA tests on the bullet fragments. Harold Weisberg, perhaps the most dogged of the early researchers, sued under the Freedom of Information Act for the records of the various neutron activation analyses. The case dragged on for 17 years, with the Department of Justice claiming that public knowledge of the data was not in the interests of ‘national security’. The tests given me show that in seven ‘control’ cases where others had fired a rifle this evidence was left on the cheeks. As might be expected, given the authorities’ unwillingness to release the documents, the control tests appear to prove that neutron activation analysis can be expected to show substantial quantities of barium and antimony on the cheek of anyone who had fired a rifle of the same type as that found on the sixth floor of the TSBD. The absence of such quantities on Oswald’s cheek implies that he almost certainly did not fire a rifle on the day of the assassination. The court case is Weisberg v. ERDA and the Department of Justice , Civil Action 75–226. The documents, which still await expert appraisal, are available in the Harold Weisberg Archive, Hood College, Frederick, Maryland. Weisberg’s Freedom of Information suit disclosed that the Atomic Energy Commission had tested not only Oswald’s paraffin casts but also several bullet fragments. The House Select Committee on Assassinations in 1977 felt obliged to deal with the matter. Dr Vincent Guinn, who by this time was at the University of California at Irvine, was given the task of subjecting various bullet fragments to neutron activation analysis. CE 842, one of the fragments from Connally’s wrist, can be matched to CE 399, the ‘magic’ bullet, because both have relatively high concentrations of Sb. CE 840 and CE 567, the four fragments found in the car, can be matched to CE 843, one of the fragments from JFK’s head, because all five have relatively low concentrations of Sb. Two of the samples have indistinguishable compositions, indicating that they came from the same bullet, and the other three particles are evidently samples from another bullet. … There is no evidence for three bullets, four bullets, or anything more than two, but there is clear evidence that there are two. They displayed variable concentrations of antimony within a batch, in contrast to his samples of other bullets, in which the concentration of antimony is consistent within a batch. The amount of antimony is consistent within each Mannlicher Carcano bullet. You simply do not find a wide variation in composition within individual WCC Mannlicher–Carcano bullets, but you do find wide compositional differences from bullet to bullet for this kind of bullet lead. Thus, when you find two specimens that agree this closely, you can say it looks indeed like they are pieces from the same bullet. The neutron activation analysis further supported the single bullet theory by indicating that there was evidence of only two bullets among the fragments recovered from the limousine and its occupants. The consultant who conducted the analysis concluded that it was “highly likely” that CE 399 and the fragments removed from Governor Connally’s wrist were from one bullet; [and] that one of the two fragments recovered from the floor of the limousine and the fragment removed from the President’s brain during the autopsy were from a second bullet. Neutron activation analysis showed no evidence of a third bullet among those fragments large enough to be tested. As it happens, the HSCA did conclude that more than one gunman was probably involved, albeit on other grounds: “scientific acoustical evidence establishes a high probability that two gunmen fired at President John F. Kennedy” (ibid., p.3). The second gunman is supposed to have fired from the grassy knoll, missing his target. The acoustical evidence is not universally accepted; for a readable overview, see G. Paul Chambers, Head Shot: The Science Behind the JFK Assassination , Prometheus Books, 2010, pp.116–144. Random matches to assassination fragments of bullets from the same box are not as rare as Dr Guinn testified. Most importantly, our studies and analyses of individual bullet compositions, bullet lead source compositions and compositional mixtures in packaged retail boxes show that Dr Guinn’s statements about the uniqueness of individual bullets from the brand of bullets believed to be used in the assassination are seriously flawed. We then analyzed 10 bullets from each box. The measurement approach was similar to that used by Dr Guinn except that we used more appropriate standards, a known quality control procedure, and analyzed physical samples having a known geometry. One of the bullets analyzed matched an assassination fragment. We also found that many bullets in the same box have matching antimony and silver levels; this discovery is contrary to Dr Guinn’s testimony that based on these two elements virtually every bullet of this type is unique. Bullets do not contain pure lead. Supplies of bullet lead come mostly from recycled car batteries, and contain trace quantities of elements such as copper, tin, arsenic and antimony in varying amounts. The manufacturing process for bullets without copper or steel jackets includes a tightly controlled extra amount of antimony, usually comprising up to five percent of the alloy, which hardens the lead sufficiently to allow the bullets to function without a jacket. Guinn’s control group comprised three bullets without jackets. Each bullet contained an almost identical proportion of antimony to lead. The Western Cartridge Company’s Mannlicher Carcano bullets, on the other hand, were jacketed, and contained variable proportions of antimony and other trace elements. Guinn noted the variable proportions of antimony in the JFK bullet fragments, and mistakenly assumed that this variability was a feature of that brand of bullet. In fact, it is a feature of all types of jacketed bullets. He also claimed that the antimony within an individual bullet is distributed evenly. This was not in fact true of the WCC bullets, in which antimony tends to be concentrated around crystals of lead. Fragments which contain similar levels of antimony may come from one bullet, but may instead come from several bullets. Fragments which contain differing levels of antimony could come from several bullets, but may instead come from different areas within one bullet. In short, neutron activation analysis cannot be used to determine the origin of bullet fragments. The technique is no longer used by the FBI for this purpose. There is no reason to suppose that the bullet fragments retrieved from Governor Connally’s wrist have any connection with CE 399, the magic bullet. The absence of damage to the base of CE 399 makes it extremely unlikely that the fragments of lead came from that bullet, which in any case appears to have been entered into evidence fraudulently at a later date. If Governor Connally’s wrist wound was not caused by the same bullet which injured President Kennedy, the single–bullet theory is false, and more than one gunman must have been involved in the assassination. Nor is there any reason to suppose that the two large fragments of copper–jacketed bullets retrieved from the presidential limousine, CE 567 and CE 840, have any connection with the shot or shots to President Kennedy’s head. The presence of dozens of tiny particles of bullet lead in JFK’s skull suggests very strongly that a non–jacketed bullet had been used. Such a bullet could not have been associated with any of the shells found in the TSBD. Again, the implication is that more than one gunman was involved. In addition to the paraffin casts and the bullet fragments, a third type of physical evidence had been suggested as a subject for neutron activation analysis: the damaged areas at the front of President Kennedy’s shirt and on his tie. Would neutron activation analyses show if a bullet passed through the hole in the front of President Kennedy’s shirt near the collar button area and also if a bullet passed through the material of his tie? Neutron activation is a sensitive analytical technique to determine elements present in a substance. During the course of the spectrographic examinations previously conducted of the fabric surrounding the hole in the front of the shirt, including the tie, no copper was found in excess of that present elsewhere in undamaged areas of the shirt and tie. Therefore, no copper was found which could be attributed to projectile fragments. It is not felt that the increased sensitivity of neutron activation analyses would contribute substantially to the understanding of the origin of this hole and frayed area. 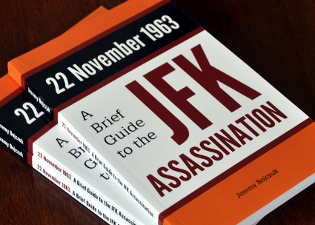 In other words, normal spectroscopic examination had already shown that the cuts in JFK’s shirt collar and tie had almost certainly not been caused by a copper–jacketed bullet, and Hoover feared that NAA would only confirm this conclusion (for the results of the examination, see FBI HQ JFK Assassination File, 62–109060–14). For the Warren Commission’s single–bullet theory to be credible, it was necessary for a bullet to have caused the two slits in the front of the shirt and the small nick in the tie. In its Report , the Commission mentioned that traces of copper were found by spectroscopic examination around the hole in the back of the shirt, but failed to mention the absence of copper around the slits in the front. It dishonestly left open the possibility that the damage to the front may have been caused by a bullet ( Warren Report , p.92). Gary Aguilar, ‘Review of Reclaiming History ,’ The Federal Lawyer , November/December 2007. Gary Aguilar, ‘Is Vincent Bugliosi Right that Neutron Activation Analysis Proves Oswald’s Guilt?’ at www.maryferrell.org. James DiEugenio, ‘Death of NAA’ at kennedysandking.com. Doug Hanson, ‘Bullet Lead Analysis Revisited’ at officer.com. Gerald D. McKnight, Breach of Trust: How the Warren Commission Failed the Nation and Why , University Press of Kansas, 2005, pp.198–212. Henry Hurt, Reasonable Doubt: An Investigation into the Assassination of John F. Kennedy , Henry Holt, 1985, pp.78–86. For the FBI’s misuse of NAA, see Paul C. Giannelli, ‘Comparative Bullet Lead Analysis: A Retrospective’, Criminal Law Bulletin , vol.47 (September 2011), pp.306ff. For the case that the CE 399 bullet was not found in Parkland Hospital, see Gary Aguilar and Josiah Thompson, ‘The Magic Bullet: Even More Magical Than We Knew’ at history–matters.com. Did Lee Oswald Leave Any Fingerprints? Was Lee Harvey Oswald on the TSBD Front Steps?